University researchers have clearly demonstrated the success of Vita’s swarm lures and revealed a fascinating new aspect of honeybee biology. Introduced in 2011, Vita’s Honeybee Swarm Attractant Wipes are a simple and low cost way of attracting of honeybee swarms to specific locations. They help beekeepers manage their bees, increase the prospects of bigger honey harvests and can help prevent swarms occupying inconvenient locations. The lures resemble cleansing wipes in sachets and are impregnated with natural oils. The researchers showed that the Vita swarm lures are highly effective and succeeded in attracting between 60% and 90% of swarms in a test apiary of 40 healthy colonies. The lures were effective when placed just a few metres from the original colonies. The researchers also discovered a fascinating difference in the behaviour of primary swarms (headed by an old queen) and secondary swarms (headed by one or more virgin queens). 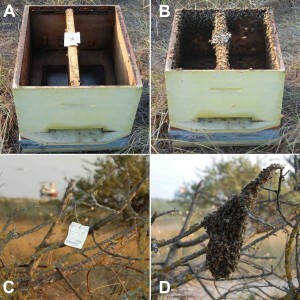 Secondary swarms were attracted to empty hives containing the lure and immediately started setting up a permanent nest. In contrast, the primary swarms were attracted to the lures pinned to the branches of trees and only then would they start looking for a permanent nest site. Full details on the Vita swarm lure and its use can be found here. The paper Attraction and direct establishment of primary and secondary honey bee swarms using swarm-tissue sachets by Dr Alexandros Papachristoforou and Konstantinos Ilanidis has been published in the latest issue of IBRA’s Journal of Apicultural Research and is available online. Vita (Europe) Limited is a mite control and honeybee health specialist. It is the world’s largest dedicated supplier of honeybee health products to the honey and pollination industries. With headquarters in the UK, offices in Italy, France and Russia, and partners across the globe, Vita researches, develops, and manufactures a range of honeybee health products. These products are marketed internationally through a network of 60 distributors in 50 countries. Vita’s product range to improve honeybee health includes anti-varroa acaricides – Apistan® (outside the USA/Canada) and Apiguard® – chalkbrood and wax moth controls, foulbrood diagnostic kits and health-promoting feeds. Vita products have been registered by more than 60 veterinary authorities. Vita invests a very high proportion of its turnover in research and development. Research partners include universities such as Cardiff, Milan, Udine and Naples and institutes such as the Tierhygienisches Institut (Institute of Animal Health) in Freiburg, Germany, the UK Central Science Laboratory and the USDA in America. Vita’s innovative research and development work has been recognised by and has received support from the UK Government. See www.vita-europe.com for more information. Follow Vita as “Vita (Europe) Ltd” on Facebook and Google+ and as “@vitaeuropeltd ” on Twitter.